NOTE: The Sharepoint Plugin is compatible with SharePoint 2010 Enterprise Edition (On-Premise installations only). Not compatible with SharePoint Office 365 at this time. This Plugin task type will upload a file that is submitted in a file attachment question on an Integrify web form to the specified document library (and folder) in SharePoint. Form containing file to upload: The Form in the process that contains the file attachment question that will be uploaded to SharePoint. 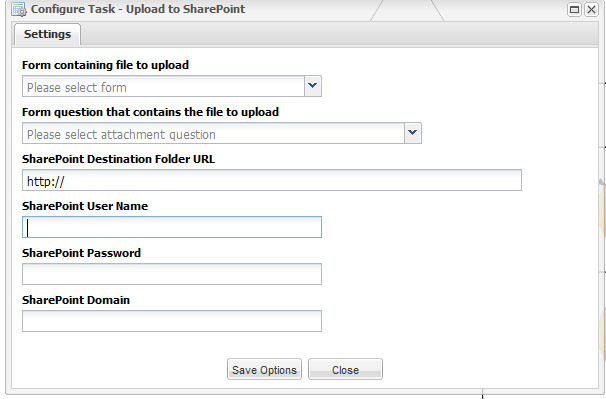 Form question that contains the file to upload The file attachment question on that form that will be uploaded to SharePoint. SharePoint Destination Folder Existing folder in SharePoint into which file should be uploaded. SharePoint User Name, Password, Domain – This is connection information for connecting to SharePoint. The file is uploaded as this user.